I have a serious affinity for pumpkin pie, y'all. Not only is it one of the healthiest desserts you can eat, but it's a perennial Fall favorite in our house. Creamy, dreamy, spicy perfection. I've been making Pumpkin Pies for decades now, and it's no big secret how I do it: One big can of Libby's pumpkin pie mix, follow directions on the back, and ramp up the spices of cinnamon, nutmeg, cloves, and just a smidge more ginger. Yes, you read that right. The Gleeful Gourmand uses a pumpkin pie mix to make her famous pumpkin pie (gasp!). And pre-packaged pie crusts (the horror)! I finish it off with either maple syrup whipped cream, or bourbon whipped cream, and it earns rave reviews every year. But in the far reaches of my mind, there's been a nagging little voice compelling me to switch up. "It's time," it whispers. "Your pumpkin pie has been done. Let's break free! It will be fun!" I like that little voice. It inspires a lot of creativity. But here's the problem with most Fall pies out there: either they're stuffed with apples (husband is allergic), or stuffed with nuts (husband and kiddos are allergic). That doesn't leave a whole lot left, and the truth is, I'm just not a cheesecake lover (which seems to be your only other option). What I do love a whole real lot, however, is chocolate. 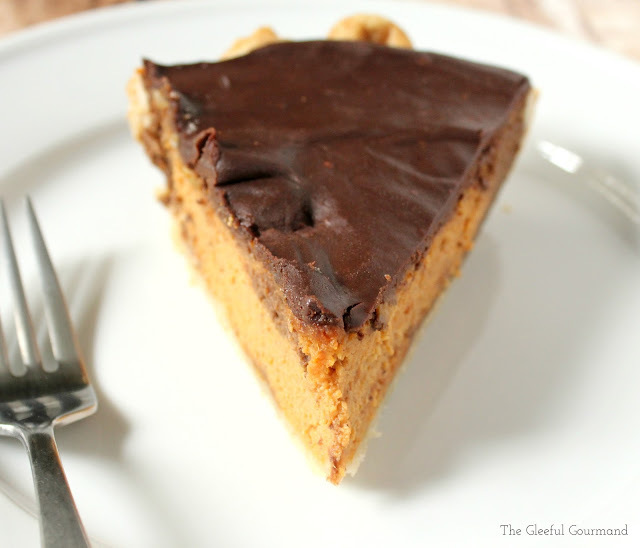 So when I came across this Mexican Chocolate Pumpkin Pie in the latest issue of Better Homes and Gardens Magazine (on newsstands now, Nov. 2015), the little voice got very insistent: "This is the one! This is the one!" 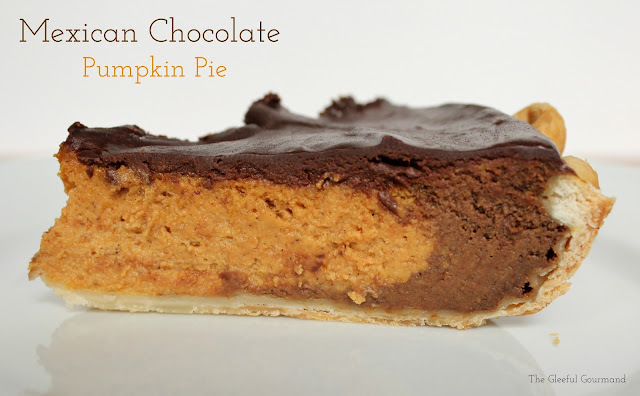 Layers of spicy chocolate pumpkin, traditional pumpkin pie, and a glossy finish of chocolate ganache. That's a no-brainer right there! What's not to love in that lineup? The recipe seemed easy enough the first time I glanced at it, so I decided to not only go for it, but also go for making their Baked Piecrust from scratch. For the first time. That was a big mistake. Though I followed the recipe word for word, measure for measure, I still managed to botch it up completely. I can't even say I psyched myself out, because I was all sorts of confident - right up until I brought the chilled disk of dough out of the refrigerator and started to roll it out. I'm not even sure I can tell you what went wrong, but I can tell you it ended with me clumping it back together after several failed attempts and throwing it in the trash can in a blind rage. Packaged Pie Crusts to the rescue! This was more like it, though because of the hurry I was in (this was for a Halloween party that was taking place in a few hours), I messed up again and managed to not get that pretty fluted edge I was going for. No matter. The base layer of Mexican chocolate and pumpkin mixture was poured in, followed by the traditional pumpkin pie filling. Here's a note: It calls for a 3.1 oz disc of Mexican chocolate, but I couldn't find it at my regular grocery store. Now I know you can find it at Whole Foods, but if you can't get your hands on some, all I did was take 3 ounces of a semisweet baking bar, and added a pinch of cinnamon, plus a pinch of sugar to it to mimic the flavors of the Mexican chocolate. Also be forewarned that at stores like Whole Foods you're going to find about a hundred different varieties of "Mexican chocolate." I would choose the cinnamon one in the future. Tell me you don't want to grab that fork and dig in! While the pie baked, I worked on my chocolate ganache, and finally it was ready to chill out in the fridge until party time. And oh, wow. That first bite? All the notes of pumpkin pie with the richness of chocolate, plus the wonderful notes of heat from chili powder and cayenne - not overwhelming, but rather a low, slow burn of spicy pleasure. 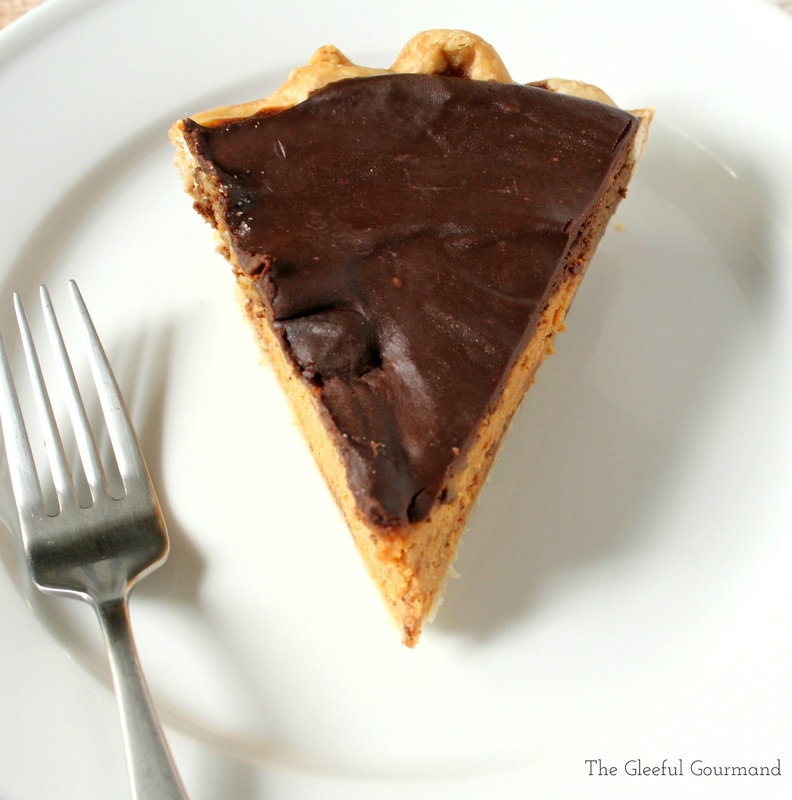 Capped off with that topping of decadent ganache, I knew, 100% that my regular pumpkin pie was not going to be making an appearance this Thanksgiving. 1. *Prepare your baked piecrust - you can go online to bhg.com to get their recipe, or you can use a packaged pie crust and follow their directions for how to pre-bake it. 2. Preheat oven to 350˚F. In a small saucepan heat chocolate and butter over medium-low heat, stirring constantly, just until melted; set aside to cool. In a large bowl combine brown sugar, pumpkin pie spice, salt, chili powder, and cayenne. Stir in pumpkin and eggs until combined. Gradually stir in half-and-half until combined. 3. Stir 1 1/2 cups of the pumpkin mixture into the cooled chocolate mixture. Pour into the baked piecrust. Pour remaining pumpkin mixture over chocolate layer. Cover edges with foil. Bake 60 minutes or until edges are puffed and center appears set. Cool on a wire rack. Spoon Chocolate Ganache over the top. Sprinkle with grated chocolate and chili powder if desired, and chill within 2 hours. Makes 8 servings. Chocolate Ganache: In a small bowl place 3.1 oz. chipped semisweet chocolate and 1/4 tsp. cinnamon. In a small saucepan bring 1/4 cup whipping cream to simmering; pour over chocolate. Let stand 5 minutes. Stir until smooth.